I made a set of 3 headbands for a little friend of my daughter for her birthday. I couldn't think of an appropriate way to wrap these up that would make them look substantial. Don't get me wrong I think these make great gifts but if you were to just wrap them up it would be a tiny package and wouldn't compare to the mounds of plastic toys at a birthday party. Even though if you went out and bought the headbands you'd be spending at least $5 a piece so that's a $15 gift but would look like a $1 gift if not packaged accordingly. So I ran around the house this morning and looked for things I could use. 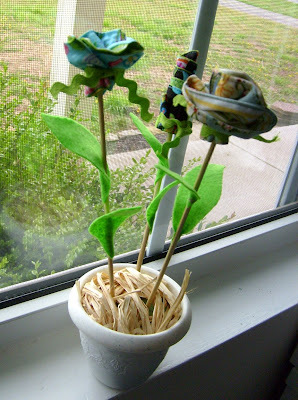 I spotted and empty little flower pot and a recent tutorial came to mind: April Flowers over on the Going Sew Crazy blog. Thus was born the Headband Bouquet! 1) Add a few rocks to the bottom of the pot. Cut a piece of floral foam to fit snugly in to the pot and about 1/4 inch below the top of the pot. 2) Cut out some leaf shapes from green felt. I used 2 leaves per flower. 3) Since this was gift for a 3yr old I cut the pointy end of the skewers off and made them all different lengths. 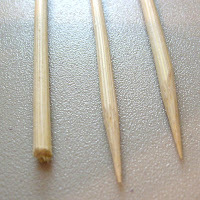 It is easy to do this by scoring the skewer with the kitchen shears and then breaking the piece off with your hands. 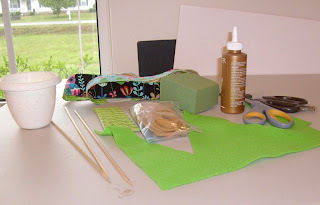 5) Lay out the head band as shown in the first picture, then roll from the large side to the short side onto a skewer keeping the elastic tucked inside. secure with a rubber band and then cover the rubber band with ribbon or ricrac. 6) Another way to do the flowers (which I like better) is to use a needle and thread to make a basting/gathering stitch along the bottom of the head band. Lay the head band out as shown and start at "a" go to "b" and end at "c". Pull the thread tight to bunch up the fabric. Roll onto skewer and secure as before. 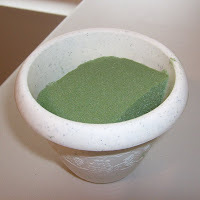 7) Insert into pot and cove r foam with Easter grass, pebbles, or rafia. Wait.. I just realized the post from above was a giveaway post! I would be NUTS not to enter!!!! oh no am i too late!? drats.